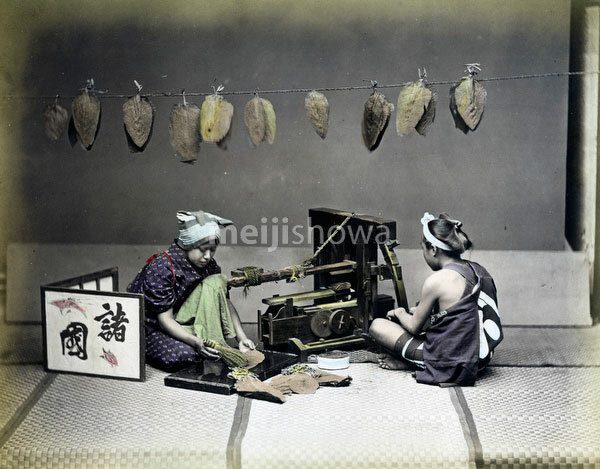 A woman and a man in traditional Japanese clothing are cutting tobacco leaves. The man is using a machine. The woman is brushing a leave with a small hand brush. A small screen can be seen on her left. In the background, tobacco leaves are hanging from a string. Tobacco was usually smoked in a long-stemmed pipe called kiseru. The word had its origins in the Cambodian word for tube, khsier. Smoking kiseru pipes was extremely popular, even among women, but they were completely replaced by paper wrapped tobacco by the Taisho Period (1912 – 1926). Same as 80129-0043 and 70601-0014.